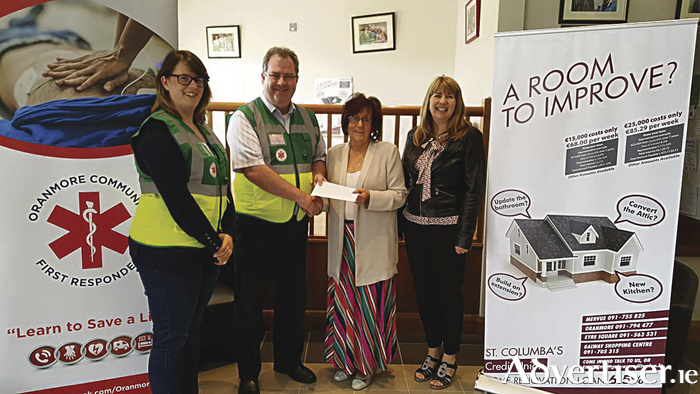 Pictured at a recent sponsorship to Oranmore Community First Responders: Claire Bailey, Ken Scally, Phil Grealish (St Columba's Credit Union), and Eileen Dunleavy (St. Columba's Credit Union). Galway East TD Sean Canney has called for a level playing field for self-employed people, saying that issues such as insurance, rates, and increased paperwork are making self-employment more difficult with each passing year. Deputy Canney met a group of self-employed people in Tuam last week to discuss the issues affecting them. "A number of major issues were highlighted on the night," he said. "They include the excessive cost of insurance, the penal cost of rates, the lack of support for self-employed people when they are sick and cannot earn a living, and the ever-increasing paperwork load attached to the operation of a business. "One in every six Irish workers earns a self-employed income. Self-employed people are the backbone of our economy and have suffered greatly as a result of the last 10 years of austerity. In order to help small businesses to survive, we have to tackle these issues. "I will be preparing a submission for Government based on the issues raised," Dep Canney added. "The Programme for Government has recognised the importance of the self-employed and we need to continue to implement the measures contained in the Programme for Government to ease the burden on self-employed people."